There’s no question that social video has become a critical part of online marketing. After all, Facebook alone has 8 billion video views per day, and Bloomberg reported that Snapchat had 10 billion video views per day as of April 2016. That’s not even counting all the other social media video formats on channels like Instagram, Twitter, and YouTube. And if you think you’re seeing a lot of video in your social feeds now, hold onto your hat: Cisco predicts that online video traffic will increase three times from 2015 levels by 2020, so that video traffic will represent 82 percent of all consumer internet traffic within the next three years. Perhaps it’s not surprising, then, that more than 70 percent of U.S. marketers planned to use social video ads within the 12 months starting May 2016. Of course when we talk about social video, we’re actually talking about several different things at once. While some types of video are designed to have a long shelf life, others are much more ephemeral, disappearing after only a day. Let’s look at the different social media video options beyond the standard native social video, and explore how to use them on the various social media platforms. Here’s a primer on each of the social media video formats, including the key technical details you need to create one for each network. According to eMarketer, more than a third of internet viewers say they watch live video online, with Facebook Live as the most popular channel, followed by YouTube live streaming. Live video is also available on Twitter and Instagram. You can start a Facebook Live broadcast spontaneously, or schedule one for later. The commenting feature on Facebook Live Video makes it a great way to interact directly and authentically with your clients and fans. Find the step-by-step instruction and some best practices for maximizing your audience, in our guide to Facebook Live video. Most technical requirements for YouTube live video are managed through a YouTube verified encoder. You’ll need to download one before you can post live video on YouTube. The video below explains how to start your first stream. You can also use Live Chat to interact with viewers—or allow them to interact with each other—during your stream, as explained in the video below. Keep in mind that while the live video is archived after you finish broadcasting, the live chat is not. Twitter has owned the live-broadcasting app Periscope since before the latter even launched. But only in December 2016 did Twitter make Periscope’s live video functionality available to all Twitter users, without downloading the Periscope app. For now, you can only live stream directly on Twitter from your smartphone. For more options—like the ability to stream from a professional camera or GoPro—you can send your stream to Twitter from the Periscope app, as we explain in our Periscope marketing guide. To launch your live social video straight from Twitter, tap the compose icon, then Live. When you’re ready, tap Go Live to start broadcasting. Unlike live videos on the other social networks, Instagram live videos cannot be archived. Once the broadcast is over, the video is gone, so make sure you’re also recording to another source if you want to have something more permanent. It’s pretty simple: you can share live video on Instagram from your smartphone with the latest version of the Instagram app. The maximum live video length is one hour. To launch your live Instagram video, tap the camera icon in the top left corner of your screen or swipe right from your feed, then tap Start Live Video. The broadcast will appear in your Instagram Story. Think of 360 video as an entry point to virtual reality: it’s a social media video format that lets viewers virtually rotate the camera to change their point of view, allowing them to immerse themselves in the content you present, as in this National Geographic 360 video on Facebook. The format of 360 video is still new enough that it stands out from regular old 2D video. 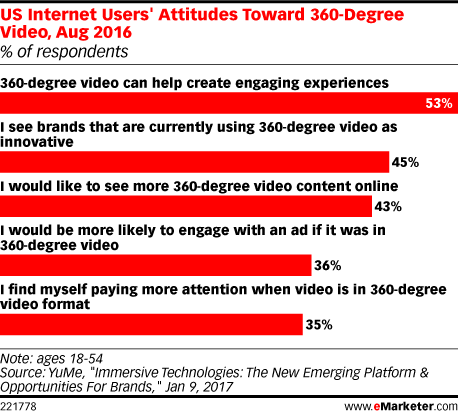 According to eMarketer, more than half of users find 360 video engaging, and more than one-third say they’re more likely to engage with 360 video than with other social media video formats. You can post pre-recorded 360 videos on Facebook and YouTube. To create these videos, you’ll need a 360-degree camera—a small device that records from all angles, mimicking a multi-camera set-up. If you record your video with a 360-degree camera, it should automatically add metadata to the file that will allow Facebook to recognize the file as a 360 video, so you can upload it to your page as you would any other video. If not, you can add the metadata yourself. Before publishing the video, click the Advanced tab, then check the box next to This video was recorded in 360° format. Click the 360 Controls tab and set the default point of view. For inspiration, check out these great examples of how brands are using Facebook 360. YouTube has more specific metadata requirements than Facebook, so you may wish to follow their guide to adding metadata using an app or script. Then, you can upload the file like a normal video, but be aware that it can take up to an hour for the 360 effect to become available. Blend live video with 360 video, and what do you get? That’s right: live 360 video, combining the interactivity and virtual reality elements of 360 video with the immediacy of live streaming. Facebook and Twitter have both launched live 360 platforms, but they are only available to select publishers for now. Facebook’s program should roll out more broadly later this year, and Twitter is taking a waitlist for its live Periscope360 program. Periscope360 will roll out to iOS users first, and for now only supports integration with the Insta360 Nano camera. Don’t feel like waiting? YouTube already offers live 360 video broadcasting to everyone. There’s just one extra step for Live 360 videos. Under Advanced Settings, check the box next to This live stream is 360°. Ah, remember Vine? The original looping social video network is no more, but its legacy is alive in the looping video functionality available on Twitter and Instagram today. When Twitter shut down Vine in January, it announced that all Vine-length videos posted to Twitter would loop—regardless of what tools were used to create them. So, post any video less than 6.5 seconds long to Twitter and watch it loop away. Learn more about creating social video for Twitter and get the step-by-step instructions for posting video Tweets in our post, How to Make a Blockbuster Twitter Video for Business. Technically, all videos loop on Instagram. But for short, fun, looping videos, you’ll want to investigate Boomerang, the Instagram app that takes a burst of up to 20 photos and turns them into a video that loops forward and backward. Once again, Instagram keeps the technical requirements simple. You can create and share Boomerang videos from any smartphone with both Instagram and Boomerang installed. You can find step-by-step instructions for creating a Boomerang looping video for Instagram, along with best practices and examples, in our post on Instagram apps. Boomerang’s looping functionality is also available in Instagram Stories. Similar to Twitter, Facebook automatically loops short videos. But there are a few differences. While Twitter loops any video up to 6.5 seconds long indefinitely, Facebook loops videos shorter than 30 seconds for a total of approximately 90 seconds. So, if you upload a six-second video to Twitter, it will loop forever, but if you upload that same video to Facebook, it will loop 15 times. If you upload a 10-second video to Twitter, it won’t loop at all, but if you upload that same video to Facebook, it will loop nine times. That means Facebook will automatically show you this video of a shirtless firefighter running toward the camera 13 times (you’re welcome). Not every video needs to stick around forever. Sometimes it’s all about creating timely, in-the-moment content that will disappear soon after it’s posted. If you’re feeling particularly ephemeral, you can head to Snapchat or Instagram Stories. For the best social video experience, keep in mind that since these videos are intended to be watched exclusively on mobile, they’re best filmed vertically. The technical requirements are the same for Snapchat and Instagram: a smartphone with the appropriate app installed, and a maximum video length of 10 seconds. Snapchat is the originator of the disappearing social content concept. Like anything posted to a Snapchat Story, Snapchat videos disappear after 24 hours. Of course, if you want them to last longer, you can always save them and post them to other social networks as well. Don’t forget to try out Snapchat lenses—even if you look ridiculous, it will only be for 24 hours. You can find step-by-step instructions for posting disappearing social videos to Snapchat in our Snapchat Beginners Guide. Like Snapchat Stories, Instagram Stories disappear after 24 hours. While Instagram doesn’t offer lenses, it does allow you to add text or stickers, or draw on your video before posting, like in Snapchat. Followers can see your Instagram Story by tapping on your profile photo in the bar at the top of their feed. To share a disappearing video on Instagram, tap the camera icon in the top left corner of your screen or swipe right from your feed. Tap and hold the circle at the bottom of your screen, or swipe left and then tap Hands-Free to start filming. Tap Your Story to post the video. If you’re creating high-quality, high-definition social video, especially in longer formats, you will probably want to post to YouTube or Vimeo, as both support full HD videos (1080p) and Ultra HD 4K. Each of these social media video platforms has its own strengths and weaknesses, of course, and it would take a whole other post to help you decide which is best for your business. Fortunately, we’ve already written that other post. We’ve also got posts where you can find step-by-step instructions for creating a YouTube account and learn how to get more YouTube video views. Ready to put your video marketing plan into action? With Hootsuite you can upload, schedule, publish, promote, and monitor your social videos from one platform.